Articles for December 2010 Year » SoftLab-Portable.com - Portable Soft! VirtualDub Portable is the popular video capture/processing utility packaged as a portable application, so you can take your images with you and do your editing on the go. 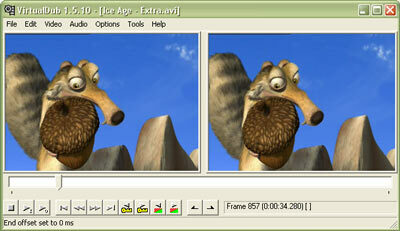 VirtualDub Portable is a video capture/processing utility. It lacks the editing power of a general-purpose editor such as Adobe Premiere, but is streamlined for fast linear operations over video. It has batch-processing capabilities for processing large numbers of files and can be extended with third-party video filters. VirtualDub is mainly geared toward processing AVI files, although it can read (not write) MPEG-1 and also handle sets of BMP images. STOIK Color By Number v4.0.2.3383 portable - it’s smart paint by numbers software, that let’s you convert photo to a paint-by-number pattern. Stoik Color by Number – this is paint by numbers software for adults and for kids. Make your own color by number pages and worksheets! Music Convert Master v5.2.1.420 portable is a quick and easy-to-use audio converting utility that allows you to convert audio files between WAV, OGG, MP3, MP2, RAW, WMA, VOX, MPC, MP+ and other well-known media formats at your will. It seamlessly integrates into Windows and is always accessible without having to bring up a clunky, screen-hogging interface. It has a high quality 32 bit converter engine that makes pro quality conversions from the most common audio formats. With simple click, you can convert audio in less than a minute without losing the audio quality. Acme Photo ScreenSaver Maker 3.22 portable is a professional photo screen saver software. It is easy to build an excellent cool effect screen saver with your own photos and music fast. No particular skill needed, no complicated settings, whether you are a screen saver beginner or a professional, this screen saver maker of choice for you will make your screen saver software experience more rewarding. let's meet on zhmak.info Using this tool, you can create self-install screen savers which are compatible with most Windows platform, distribute and share your screen savers with family, friends or people on the web. Try this screen saver software and have fun today!